Alex French is the co-founder of Bizzy, the first healthy cold brewed coffee on the market. He and his co-founder, Andrew started Bizzy with one goal in mind; to produce the healthiest and most convenient products on the market. Their journey began in 2013 while working in the corporate world and training for a 24-hour obstacle race. In order to be on their A-game, they needed to supplement a healthy lifestyle with something that could provide fast and healthy energy. Using themselves as lab rats, they became obsessed with creating the highest quality and most convenient cold brew coffee possible. In 2016, Bizzy Coffee was launched. 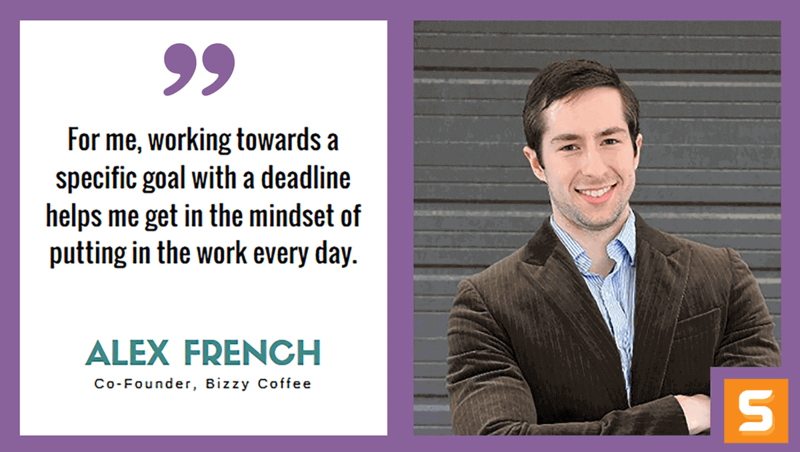 In this interview with Startup Savant, Alex shares how he and his co-founder brought Bizzy Coffee to life, their biggest milestone and a peek at what the day-to-day of a delightfully caffeinated entrepreneur looks like. The best advice I can give to someone wanting to start a business is to tell their idea to anyone that will listen. This will help you refine your idea, grow your team, and force you to start. Keep reading for more of Alex's entrepreneurial insights. To learn more about this delicious cold brew coffee and how they've built a solid brand, follow Bizzy on Twitter! What motivated you to start Bizzy? Did you see a way to serve customers better than your competitors? Bizzy was started out of a personal need for a healthy and convenient form of energy. At the time my best friend and I founded the company, we were working corporate jobs, running a group fitness company, and training for a 24-hour obstacle race. In order for us to be performing at our best in every aspect of our lives, we required a simple, natural and convenient source of energy. Cold brew coffee was the perfect product, but at the time it was extremely inconvenient to make and wasn’t easily attainable – we set out to change that. Most businesses evolve over time. Is there a way that you slowly evolved the mission of Bizzy to serve your customers better? Our business is constantly evolving, as any business that wants to last should. In our industry, the market has become very competitive due to low barriers to entry and explosive demand. What this means for us is that we have to stay focused on serving our customers, or as we like to call them, Bizzy People. We started this company to provide Bizzy People with the healthiest and most convenient products possible and we are doubling down on the convenience piece for the launch of our new product line this spring. The biggest milestone we hit was becoming the #1 share in our category on Amazon. This proved not only to us but also to our investors that we have a great product, brand, and message. In order for us to get to that spot we first and foremost had to have a great product. Amazon ranking and sales are generated almost exclusively because of good reviews. When starting out selling a product on Amazon it is absolutely critical to ask customers for reviews. The more reviews you get, the higher you climb in ranking, the higher you climb in ranking, the more you sell, the more you sell the more reviews you get, you get the picture. Who has been your greatest influencer along your entrepreneurial journey? How did they shape Bizzy? Our biggest influencer within the company, and for me personally, was a mentor by the name of Kieran Folliard. He is a serial entrepreneur that has started and sold 4 restaurants, 1 whiskey company and currently operates 3 food companies. Kieran has been like any mentor/advisor where I can confide in him about the challenges of starting a company and because he has done it so many times he is able to make sure I make the correct decisions, which save us precious time and money. The biggest thing that we personally struggle with is competing with seasoned veterans that have millions of dollars to spend on price promotions. This is obviously specific to our market, but something that is a challenge for us. As a general struggle of a business owner, it’s managing cash as we grow the business and getting the right people on the bus. My advice to any business owner that wants to start something BIG is to get to revenue as quickly as you can and raise as much money as possible. Lack of funding kills businesses. In terms of getting the right people on the bus, I’ve found that the best way for us is to build an awesome brand, have a big vision and then scream from the rooftops about it. The great people will find you and ask to work for free. Get to as quickly as you can and raise as much money as possible. Every day it feels like there’s a tough decision that will make or break the business. That being said, the biggest decision that both my cofounder and I made was to quit our jobs and pursue this full-time. We worked part time on this “project” for close to 2 years before diving in full-time. The second we went full-time my whole life changed. First off, it’s not nearly as scary as people think. Don’t get me wrong, I went from making an extremely nice salary working at one of the best companies in the Midwest to not getting paid and sleeping on the floor of the office, BUT it was the kick in the pants that we needed to turn this “project” into a company that has the potential to change the world. It’s strengthened them substantially. Starting a business is VERY tough, and if you’re like me, you’re going to do whatever it takes to succeed. This usually means working ridiculous hours and sacrificing your free time to work on your business. Since going full-time, my personal life has definitely suffered, but it’s shown me who my true friends are. Every day is a different day as a business owner but there are definitely some specific habits I maintain to make life easier. First, I always eat the same breakfast. For me it’s oatmeal with almond milk and peanut butter and a Bizzy Coffee protein smoothie. It seems trivial, but not having to think about what I’m going to eat first thing in the morning is one less decision I have to make during the day. The other really important habit for me is exercising. Every year I sign up for some sort of physical challenge to give me a specific goal to train for. For me, working towards a specific goal with a deadline helps me get in the mindset of putting in the work every day. When starting a business it’s tough to put in the hours in the beginning because you don’t see any results, whereas with exercise you put in the work and you see results. It’s a nice parallel for me to always remember the “tough work” like bookkeeping or taxes has an impact on the achievement of my long-term goal. Reading is awesome and I’ve found myself moving into audiobooks as of late. I find that the only time I have to read is before bed and I usually only make it about a page before falling asleep. I’d say the book that had the biggest impact on my success to date is "Never Eat Alone" by Keith Ferrazzi, especially the chapter about dinner parties. What advice would you give to our readers who want to start a business in Minnesota? Where should they start? In reality, the best advice I can give to someone wanting to start a business is to tell their idea to anyone that will listen. This will help you refine your idea, grow your team, and force you to start.